Here are the 15 best asparagus recipes we’ve discovered online so far. 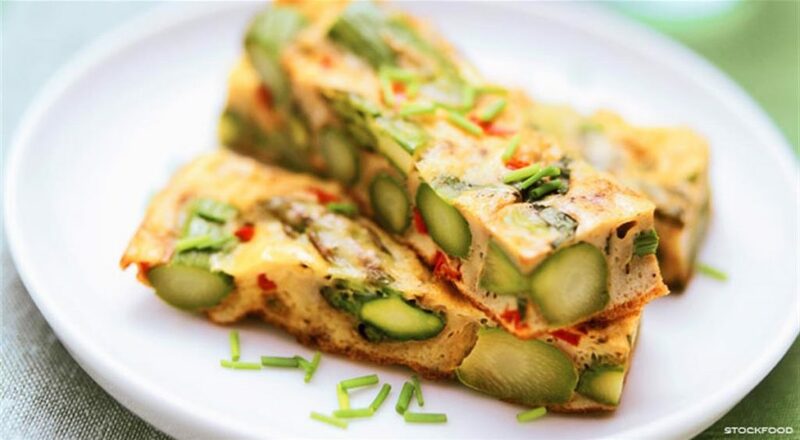 When we make this mouth watering frittata recipe, we’ll admit that we actually make two versions; one for the kids and one for the adults. This is because of the green onions. We absolutely adore the flavour and think their presence in the dish really amps up the taste of the asparagus and red peppers, but our kids just aren’t ready to that flavour impact yet. Either way you choose to make yours, get the details and full ingredients list on Fine Dining Lovers! As of late, we’ve found that our kids really enjoy stir fry style rice dishes. Perhaps it’s because they love Chinese takeout night at our house so much, but we can get them to eat just about anything if it’s presented to them like a fried rice dish. That’s why this awesome dilled chicken and asparagus in rice dish featured on Taste of Home caught our eye! If we’d told our kids we were serving them something seasoned with dill in any other form they probably would have protested but they love chicken, rice, and asparagus, so we won them over with this dinner no problem. Okay, we know we’ve been talking about what our kids will eat a lot but, if we’re being honest, we’re partially making this list because of how much we love asparagus too. That’s why we wanted to feature a few more adult recipes as well, like this fantastically fresh tasting salad from A Red Binder! 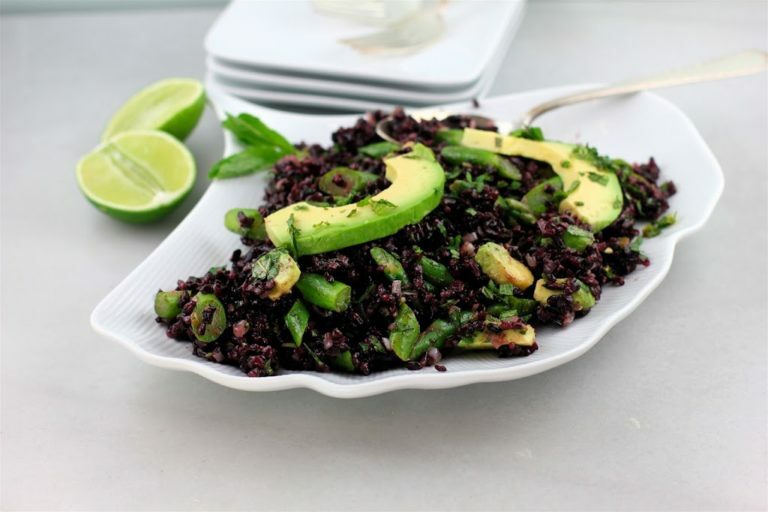 They show you how to make it from black rice, avocado, and asparagus. We actually think our kids would love this dish if we could just convince them to take a bite, but we’re still working on the whole idea of black rice with them. Some day! Just because you want to incorporate asparagus as a primary ingredient or regular guest on your family’s menu doesn’t mean it has to be the main point of the entree every time. Sometimes it makes a great side or topping! These delicious shrimp cakes topped with a mouth watering homemade asparagus salsa are the perfect example of what we mean. Find out how both the cakes and the salsa are made on The View From Great Island. If you’re going to work with simple green vegetables, perhaps that you grew fresh our of your own garden, would you prefer to make something a little more classic than an asparagus salsa, even if a side is what you had in mind? 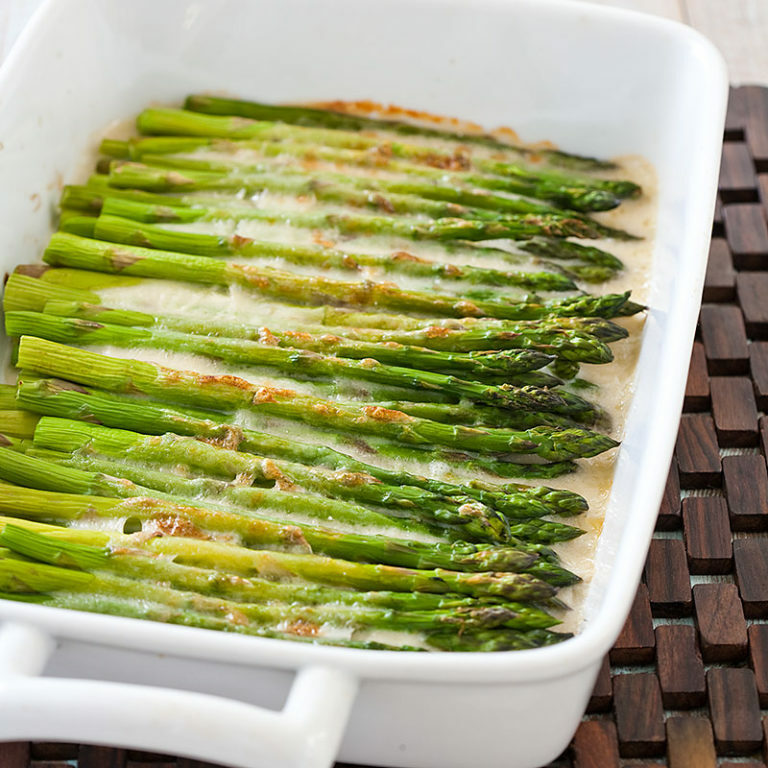 In that case, we’d absolutely suggest taking a look at how Cook’s Country made this delicious homemade asparagus gratin. This one tastes great no matter what you pair it with. If you’re going to amp up the presence of a particular vegetable on your kids’ diet because they’re willing to eat it, would you prefer to find a way to work it into any meal, at any time of day? Then you’re going to need suggestions for a few breakfast dishes as well! We actually recently made these awesomely flavourful “toasties”, as our kids call them, and we owe Foodie Crush a big thank you because they were a total hit. 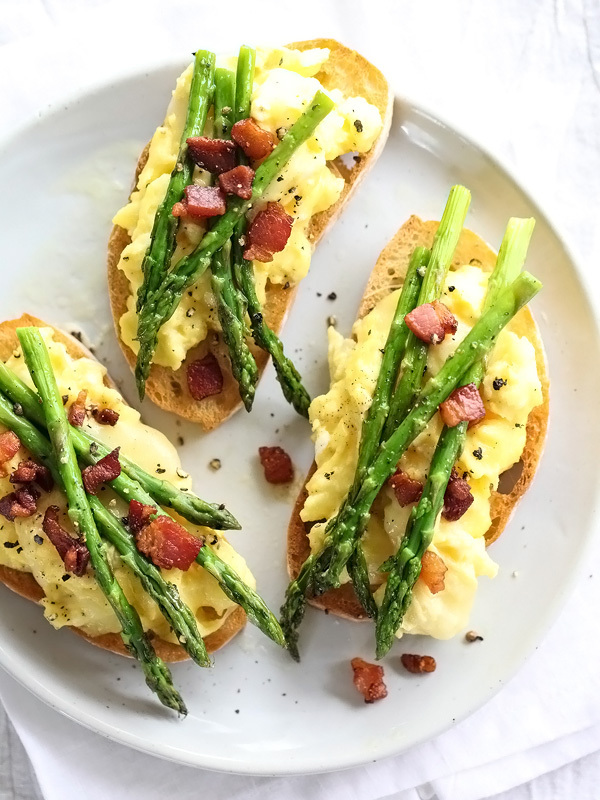 Check out their recipe to see how scrambled eggs, crumbled bacon, and asparagus can make for the ultimate open faced toast meal. In our house, anything involving cheese is a big hit. Even though they’re a little bit picky about their vegetables, we swear we could convince out kids to eat anything at all if we smothered it in cheese. 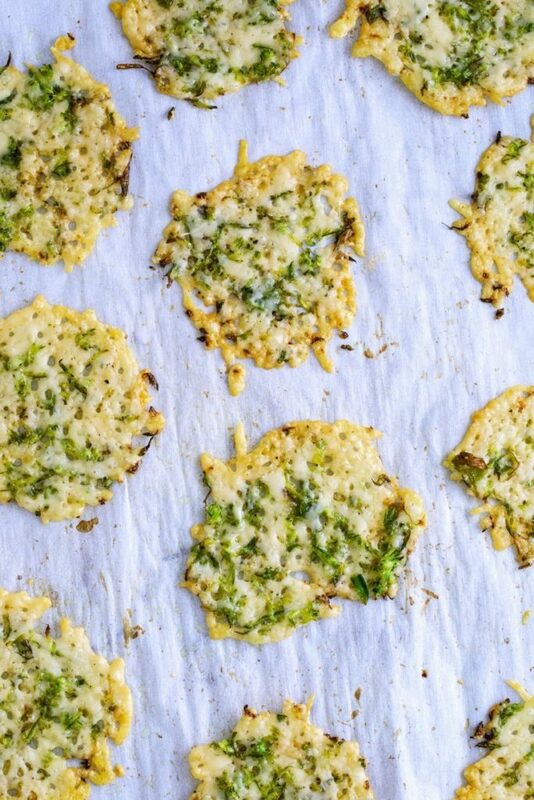 It’ll come as no surprise to you, then, that these parmesan “chips” outlined on The Ktchn were such as hit, even with their vegetable content! Check out their guide to see how they incorporated shredded asparagus and toasted the thin circle of cheese just right. While we’re considering ways to get the kids to eat asparagus in particular, let’s not forget the littlest members of the family! We often find ourselves wishing we’d introduced our kids to a wider range of vegetables than just the basic peas and carrots right off the bat so that they’d have a more diverse veggie palate by now, but alas, we’re working with what they’ll eat. 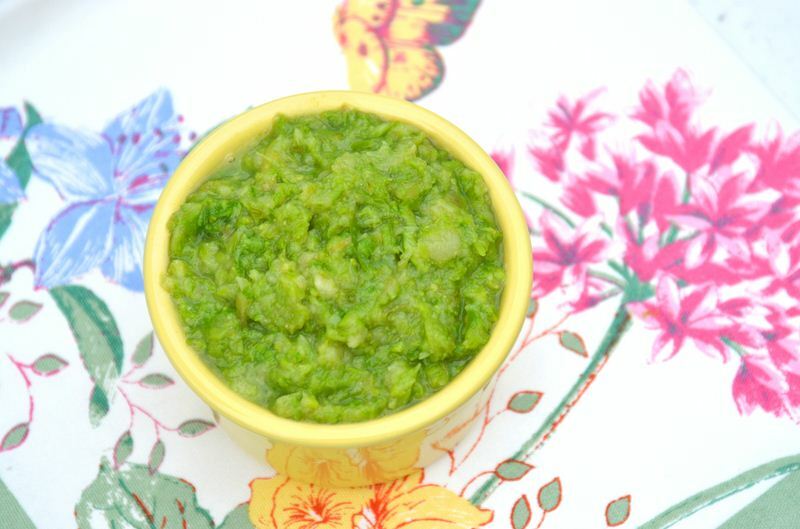 Just in case you’d prefer to get a jump on things in that department, however, here’s a fantastic homemade asparagus baby food recipe from Project Nursery. If you’re going to start making veggie-heavy homemade breakfasts, would you prefer top try a recipe that’s a little more unique and perhaps a little closer to gourmet because your kids’ taste in dishes is actually decently varied? 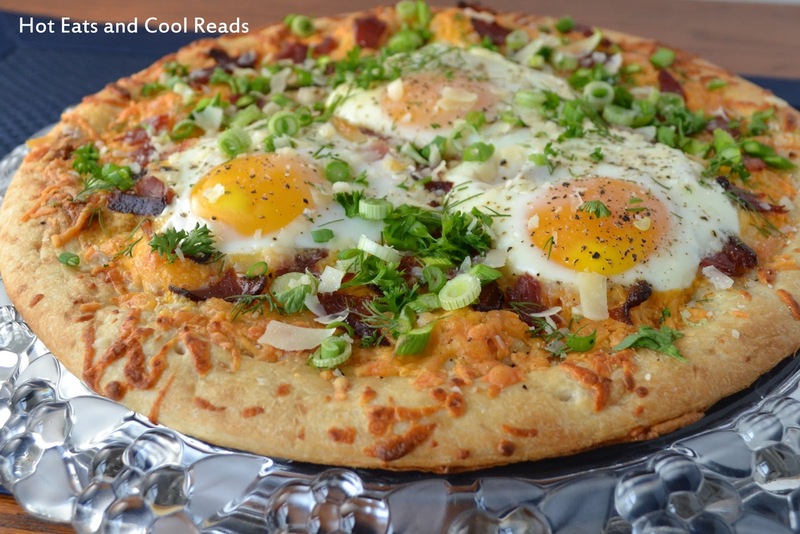 In that case, we have a feeling you’re all going to love this bacon and asparagus breakfast pizza recipe featured on Hot Eats and Cool Reads! We’re lucky that our kids completely adore eggs and will happily eat them essentially no matter how we prepare them, so that eggs slapped on top of this mouth watering pizza worked to our benefit when we tried this one out. At least once a year, we decide to go on a diet. The goal isn’t always necessarily weight loss, but rather just a desire to up our intake of good nutrition and inspire ourselves to eat the basic veggies we need so badly in more creative ways. 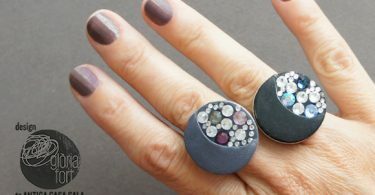 This is fun because it challenges our skills in the kitchen too! We don’t always stick with it (ice cream is a big weakness in our house), but we figured there’s no harm in trying as many times as possible. Last year, one of our favourite veggie based lunch snacks was this shaved asparagus salad featured on Simply Fresh Dinners. To our surprise, our kids actually asked us to let them join us in eating this lunch too because they really love asparagus that much. We couldn’t really tell you we’re dieting right now, but we can say with certainty that will still make this salad every so often just because it’s good. Perhaps you’re not really a whiz in the kitchen and you’re actually look for a recipe that will give you a decent breakdown of a more basic dish, just to get you practicing while you also get the kids eating simple greens? Then we definitely think you should take a look at this recipe outlined on Belle of The Kitchen! 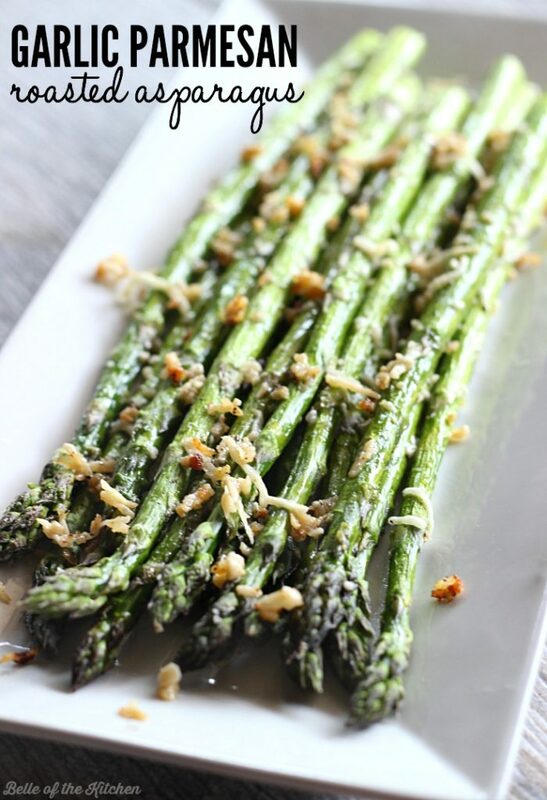 They teach you how to make a fragrant garlic parmesan roasted asparagus side dish in just a few simple steps. Did we really catch your attention when we started talking about very simple recipes because you’re only just starting your foray into homemade dishes that your kids will really benefit from, but you’ve really been hoping to find some decent breakfast ideas? Then here’s a straight out veggie side that will taste great with any other breakfast entree you choose to try your hand at! 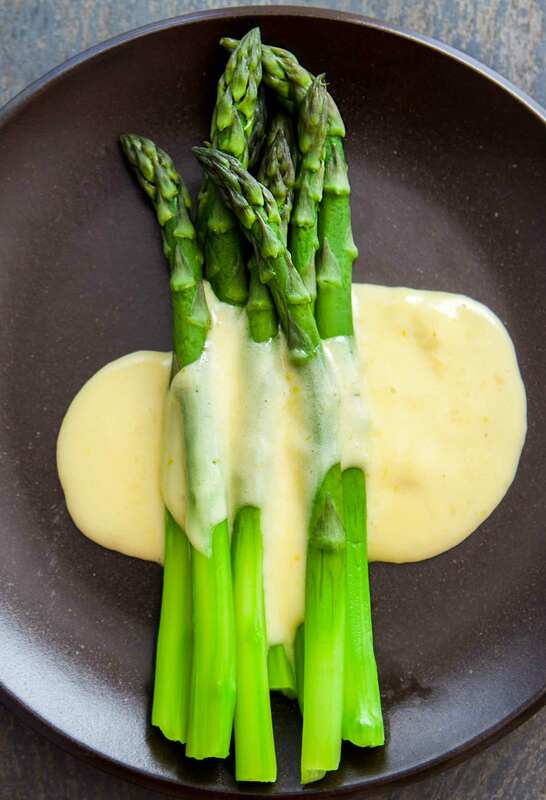 Check out how Simply Recipes not only prepared their asparagus to perfection, but also made a homemade Hollandaise sauce that’s so good it’ll definitely get your kids approval, even if they’ve never tried that kind of sauce before. 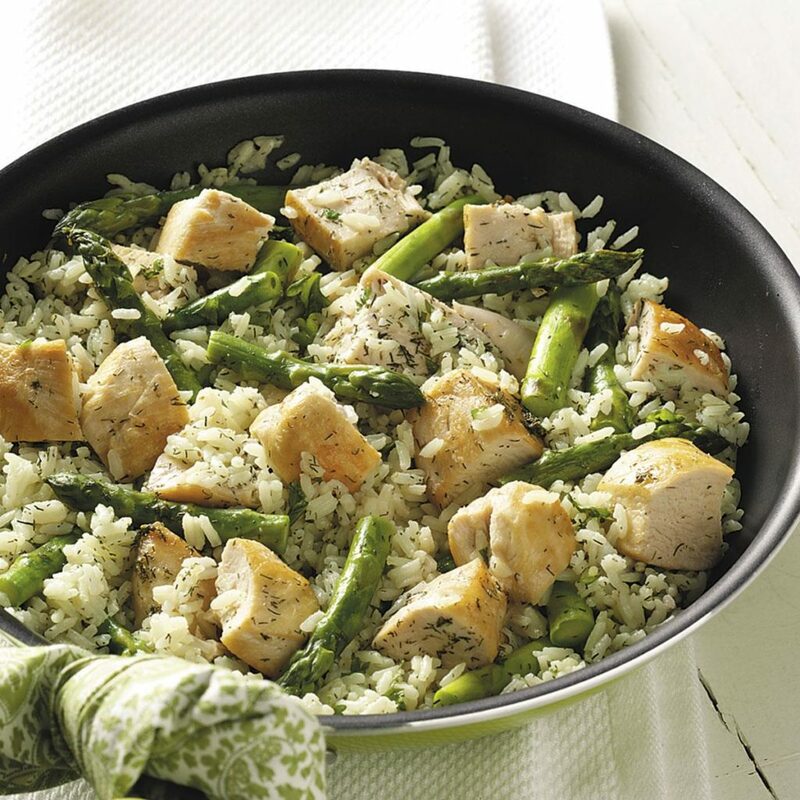 Were you quite intrigued with the idea of making a chicken and asparagus dish like the one we showed you earlier on our list but you’ve never been a big dill fan or you’d rather leave out the rice because your family gets enough carbs already elsewhere? 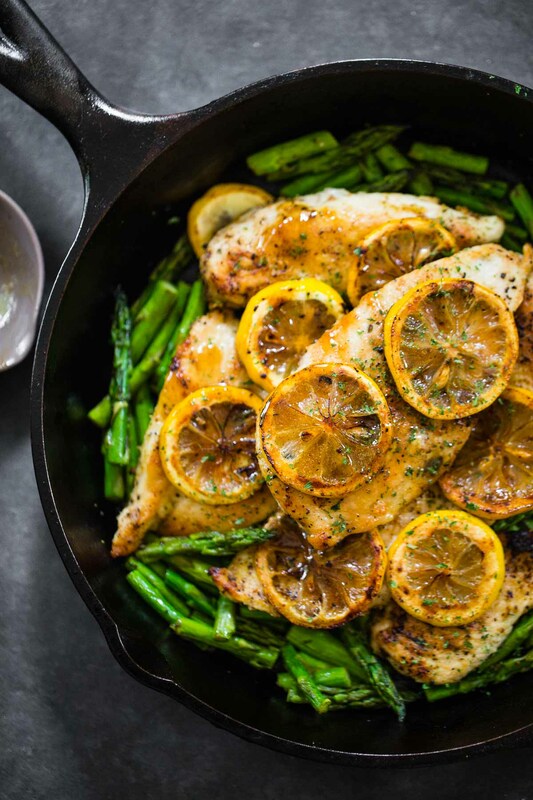 Then perhaps you’d prefer to give this lemon chicken and asparagus dish from Pinch of Yum a try instead! Check out how they grilled both their meat and their veggies to perfection. Have you actually been scrolling through our list hoping to find an asparagus dish that you can make as an hour d’oeuvre as the next potluck you attend for work? 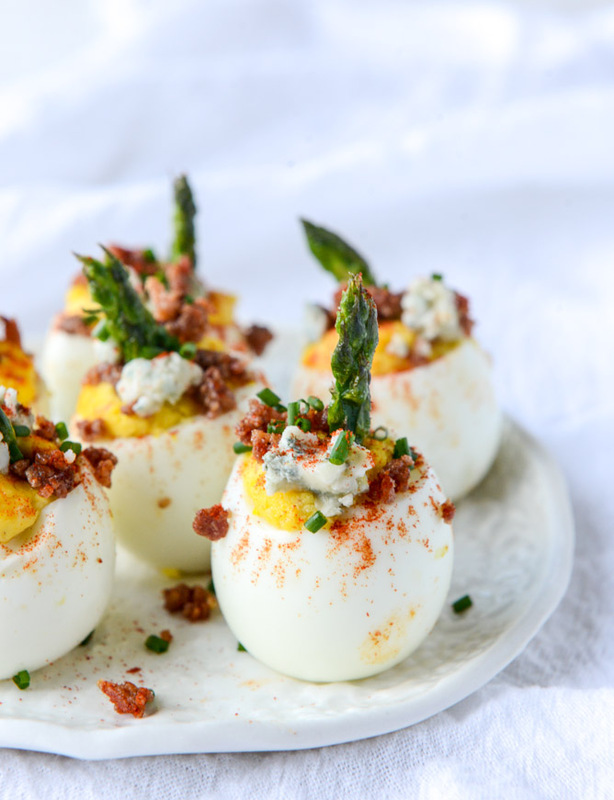 Well, we could probably write a whole second list about just asparagus based appetizers alone but for now, here’s one of our very favourites: bacon blue devilled eggs with roasted garlic and asparagus from How Sweet Eats. Are you quite into the idea of making your family asparagus as a side dish to whatever else you’re cooking but you want to collect as many simple ideas as possible, so you can bang it out basically any evening and still serve them up all kinds of flavour variation? In that case, we definitely think you should take a look at this prosciutto wrapped asparagus dish outlined on Eat Drink Paleo! 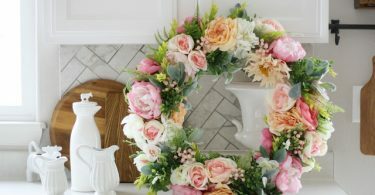 This one’s so popular in our household that everyone’s mouths start watering the second they smell it coming from the kitchen.